Engineered with flexibility and job demands in mind, every feature of this super-quiet, high-output Com-PAX-ial Blower is designed for effectiveness and optimal air-flow performance. Compact blower and canister are made of durable, lightweight corrosion-, UV- and chemical-resistant polyethylene material. Sturdy, easy-grip handles molded directly into the blower and canister housing makes for convenient, reliable transport. This versatile unit offers 25’ ducting, with the newly designed quick-connect clipping system allowing workers to attach canister, tools-free, to input side for powerful extraction or output side for ventilation. 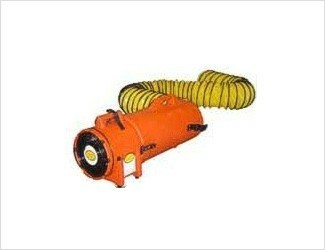 Ducting stores conveniently within canister.